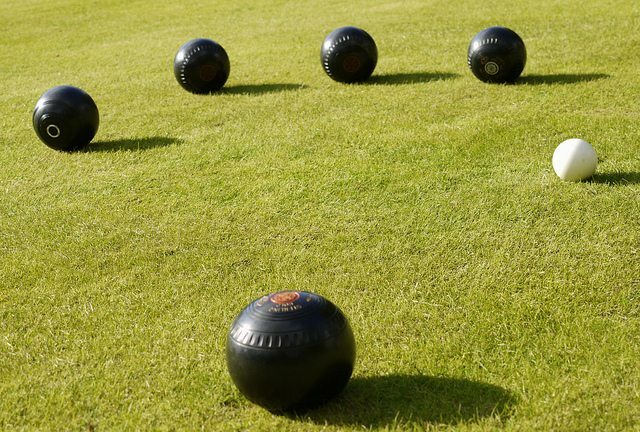 One of the Midlands’ top crown green bowling clubs is under threat of eviction from its Northfield home of almost 80 years. The King George V Bowling Club is situated at the rear of the former public house of the same name in Tessall Lane, Northfield. The Grade II listed building, currently named The Emerald by the previous owner, has been purchased by a Birmingham business man who intends to open a new venture on the site. Unfortunately, no lease agreement has so far been able to be reached between the club and the new owner. And club officials say they have been told that they will not be able to access the site from tomorrow (Friday 4th July) unless they sign a lease that the new owner has drawn up which would allow them to stay until September, even though they have not had it checked by a solicitor. Cllr Reg Corns (Con, Northfield) raised the issue at the Northfield District Committee meeting on Friday and members from both parties expressed concern for the future of the club. Longbridge Councillor Ian Cruise (Lab), himself a crown green bowler in the past, issued a strong statement of support for the club saying: “The King George V bowls club have been playing on this green since the opening of the pub in 1937. Many generations have played and still play on this historic piece of turf. The treatment of the members of the club by the new owner of the Emerald/King George V is nothing short of shocking. I find it hard to believe that a business man who wishes the local community to use his facility – I’ve heard it will be an Indian restaurant – is being so uncompromising to members of the same local community who wish to play the sport they love. If the new owner has no respect for the community and the history of this site, I would hope that people boycott his business until he is no longer the owner. With regard to the comment made about boycotting the business, I for one whole heartily agree and will not be using this establishment, nor will any of my family. A traditional game as old as this one, should be protected by law. I think that Parliament ought to bring in a law to protect and give listed status to greens the same as one would for an old building. The very game that Drake played before smashing the Spanish Armarda has some resonance with the battle that is about to be fought now. I say protected status for all bowling greens, it is part of our history and culture. Lobby your M.P. now! I am horrified that the bowling club should be lost..I am also very concerned about what is going to happen to the Emerald. I have been following its progress or lack of it. since it was effectively closed by H M Customs & Revenue over 2 years ago for employing some illegal immigrants. It failed to sell by auction and I suspect the owner is something to do with a local company that buys houses for cash as a van with it’s website on it is often in the car park. There seems to be work being done on the building but it seems to be a slow and haphazard process. You would think if it was going to be a new restaurant the owner would be telling people about it early to get customers but nothing had been forthcoming. After a fight to prevent it being turned into a supermarket years ago it would be helpful if the owner clarified what his plans are for the building. I am suspicious! i don’t think the new owner has any intentions of opening a restaurant at any point in the future it is a smokescreen for his real intentions which he will not divulge to anyone even the MP for Northfield Richard Burden and Councillor Ian Cruise who asked him outright earlier this evening but were given no specific answer. How can you pay £430k cash for something but not know what you are actually going to do with it!!!! As a business owner Myself I know that a good relationship with your customers, the local community in this case, is the best way to create support and if you intend to attract locals to use your restaurant then you need to show you care. Evicting a bowls club who attract bowlers from all over the country and have hundreds of visitors to the venue each year is not going to help. This club is one of the top clubs in England and that is due to their hard work and commitment that is second to none. This building is grade II listed so the amount of alterations to the outside is limited, it is listed because the Building and Bowling green are a part of Northfield’s history and must be protected. The huge and instant response to the news prove that the feeling about this venue is strong and I urge the new owners to come to a more satisfactory agreement. The New owners should show some respect for the history of this country and it’s residents and not just bulldoze everything, that has been lovingly built up, in a blinkered frenzy to make money. The King George V bowls club is a much needed facility in the local area and it’s members should be treated with a lot more compassion. Crown Green bowling is a sport that is only played by the British and greens should be listed to protect this counties heritage. The way these people have tried to blackmail KGV into submission makes my blood boil and only causes bad feelings, so I will never support this establishment and will actively encourage others to do the same. The great Gods Money & Developer are ruining this country on the alter of Greed. Their Mantra is “People don’t matter, Money does”. I am glad someone is standing up to this avarice and I wish you all the very best with your campaign. Over the last week or two the owner has fitted gates to the front and side of the Emerald blocking the previously open car and pedestrian access. For a while during working hours he puts his van across to prevent access to the front car park. He seems to have a bit of a siege mentality -perhaps we will have CCTV and guard dogs next!! Must make things difficult for the Car Wash – perhaps he is in dispute with them as well. He seems to be going out of the way to get local people’s backs up! That makes me think he is not himself going to open up a restaurant. He seems to work for or be involved with a Redditch based company called Right Home Sales(that’s what’s on his van) that buys properties at knock down prices for cash. The Emerald was difficult to sell and after being out of use for two years would have been in a bad way. I suspect this company will renovate it sufficient to resell to take their profit. However it seems the wrong way round to do up the outside before the inside is completed. The top floor windows look in terrible condition. What has happened with the bowling club? Have they sorted out a contract? are there any updates on the bowling club dispute?